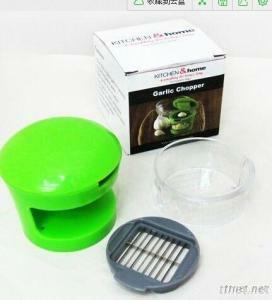 This clever chef's tool allows you to slice, dice or grate garlic in minutes! Includes 2 interchangeable grates. the extra grate stores in the bottom of the chopper when not in use. It even stores garlic, leaving no odor on your hands. Removable mesh grate for easy cleanup. Perfect for pre-cut ginger, shallots, mushrooms and peppers. Housewares, Kitchen Accessories, Kitchen Accessories/n.e.s.